The DBH elves wish everyone a merry Christmas and an ugly Christmas sweater outfit this year; get ready to find new ugly Christmas sweaters under the tree this holiday season. The ugly Christmas sweaters are so warm and cozy and they just feel like you’re wearing Christmas! I love them! The weather outside is frightful, but the DBH Ugly Sweater Collection is delight…wait, these are ugly! Santa’s elves have been hard at work in the Design By Humans workshop to create the perfect “ugly” Christmas sweater styles for the holiday office party. DBH called on its community of artists to channel their Christmas spirit and design delightfully ugly patterns to make the merriest sweaters of the season. Get ready to deck the closet halls with festive Christmas outfits from the new Ugly Christmas Sweater Collection. Christmas is the season of giving and the DBH community of artists is giving the gift that keeps on giving: the ugly Christmas sweater! Whether you are sipping eggnog at an office party or just decorating the Christmas tree, no one will want to miss out on these funny and cheerful designs. Explore the DBH selection of jolly all over sweaters to find designs inspired by retro video games, delicious cheeseburgers, or Christmas cats. Everyone will be sure to find a perfect stocking stuffer or maybe even a gift for that certain special someone from under the mistletoe. 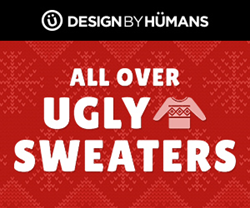 Design By Humans’ Customer Service Representative, Marie Murray, shares, “The ugly Christmas sweaters are so warm and cozy and they just feel like you’re wearing Christmas! I love them!” Christmas is just around the corner so start thinking about what to ask Santa for this year; it’s time to add a DBH ugly Christmas sweater to the Christmas list. And just remember: if there is a Design By Humans’ ugly sweater under the Christmas tree, then Santa put you on his “Nice” list! Design By Humans offers a platform for artists, gamers, and YouTubers to create and showcase their unique artwork as phone cases, wall prints, and fashionable tees, tanks, and more. With 10 years of experience, Design By Humans has woven a shared spirit that thrives on designing vibrant and meaningful art. To learn more about the vision, please visit: https://www.designbyhumans.com/.